A sunny spot where bumblebees and other large pollinators are desired. Seedlings will survive light frosts, but older plants are easily damaged. Tomato, Squash, Strawberry and Pepper. A good companion for any crop that needs strong defense from insects. 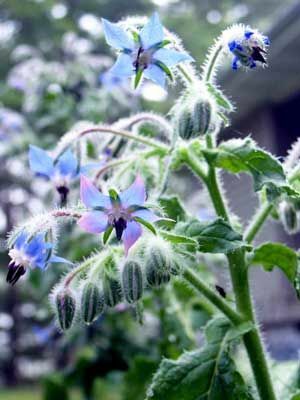 Borage attracts large buzzing insects that dominate their air space. Plant the large seeds in your garden in late spring. A fresh crop of plants can be planted in late summer for bloom in the fall. Borage seedlings are only edible when very young. Large plants produce edible, starry blue flowers that attract bees in droves. The foliage can be gathered and composted. Cut back borage plants by half their size in midsummer to encourage reblooming. Blossom clusters make beautiful but short-lived cut flowers or edible garnishes. Beware of sleepy bees when pruning or otherwise working with mature borage plants.